100% Aluminized heavy gauge materials. Internal flow pattern develops deep aggressive sound. 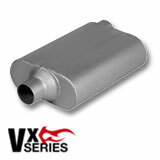 Full size muffler body for car and truck installations. 4 1/4" x 9 1/2" Oval cross section.